We'll show you how via our site, emails, videos and Facebook! We'll walk you through the how-to consign process step-by-step! Join the JBF community! We need help putting on sales like this for the community. All volunteers get to shop FIRST with 2 free presale passes & 2 50% off presale passes, plus they earn up to 75% on sold items. There are plenty of other ways to help too, like advertising distribution or providing sale necessities (Food, water, snacks). DROP OFF: Thursday, April 4 for all consignors. Drop off is from 10am - 8pm. Bring your items tagged, prepped and sorted by size. Once checked in, you can go grab the rest of your items from the car. PICK UP of unsold items for all Consignors: Sunday, April 7 from 6:30-7:30pm. All remaining items are donated to Lifebridge community services charity. Sorry, no exceptions! Consignors, these items ALWAYS sell well at JBF! So what large items sell well? Strollers. Car seats. Ride on toys. Bikes. Table and Chair sets. Kitchen sets. Toy chests and shelves. Bassinets. Play pens. 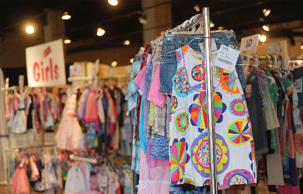 We sell children's clothing Newborn through size 20. Be selective. Shoppers want current and clean items. Be in season. Our Spring Sale is for Spring & Summer clothing only. Our Fall sale is for Fall & Winter clothing only (what your child would wear between October-March). Be Clean. No stained clothes. Look at your clothing items as if you were going to purchase them. No stained or damaged items will be accepted. Please freshly clean your clothing items. Damaged Goods don't sell. Replace missing buttons, sew loose hems and seams, and clip loose threads. Please button all buttons, snap all snaps, zip all zippers before you arrive at drop off. This will ensure that there are no defects in the clothing. Package & Hang: Hangers - Please hang clothes so the hanger hook points to the left (like a question mark). Securely attach a tag! Clothing Sets - Sets tend to sell better (under size 6) so match things up if you can. Price Appropriately. See Pricing Guide for suggestions. Hanging Clothing - Put outfits/set together to price for at least $3.00. Clothing- Attach tag with a tagging gun or safety pin to the label of shirt or upper right front of pants. Insert the gun in a label or inside seam NOT through part of the clothing (to avoid making a hole or tear in the clothing). Non-Hanging Clothing - Please put these items into clear zip-lock bags (onesies, socks, tights, infant mittens, and accessories). Print and securely tape (clear movers tape) the tag to the bag. What toys do we accept? Almost everything! Ride-on toys, block sets, dolls, remote control cars, outdoor toys, learning toys, and more. Safety is our top priority. All toys must be checked for safety recalls (link) before consigning. No one wants a dirty toy. Clean all toys and baby equipment thoroughly. Batteries are a must. Please test to make sure that toys and equipment are working properly. Battery operated toys must include working batteries (these can be purchased inexpensively at local discount stores). How to Price: Be competitive. We recommend pricing one-third of the retail value. How to Tag a Toy: Attach JBF tag directly to item with clear packaging tape or hole-punch JBF tag and tie it to item. What we accept - Exersaucers, swings, high chairs, changing tables, bassinets, pack and play, safety gates, toy chests, book shelves, Gliders and ottomans, toddler desks, tables with chairs, upholstered toddler chairs, etc. Have something you're not sure we accept? Please contact us. We'll let you know! Safety is our top priority. Item must have all parts, and be in good condition. Car seats & car seat accessories must be checked for safety recalls and a car seat waiver must be filled out. Please bring a Car Seat Checklist (link) for all car seats, booster seats, and car seat base or infant carrier. How to Package: If item has multiple pieces use packaging tape, zip-ties, or string to keep items attached together. If wooden furniture has loose parts, use clear plastic wrap to secure item. All furniture and equipment must be assembled during the sale. Price: Be competitive. See our Pricing Guideline. How to Package: Fasten shoes together with zip ties or ribbon/twine. For infant shoes or small shoes without laces, you may put the shoes in a clear zip-lock bag. We prefer no shoe boxes. However, if shoes are in the box, please remove the lid, secure it to the bottom of the box, and secure the shoes to the box (closed boxes do not sell well). How to Price Shoes: Shoes must be in good condition and should start at $3.00 for infant/toddler; Add $1 each for larger size, name brand, or heavy/winter. How to add Consignor Tag: Punch a hole in the top of your tag and attach the tag to the shoes with the ribbon, string, or zip tie. For infant shoes in a clear zip-lock bag, put the tag inside the bag and tape the bag shut with clear packing tape. How to Package: Use clear, self-seal bags or clear cling wrap (saran wrap) to hold multiple items together; Tie sets of books together with ribbon/string. Be sure that parts/games to video game systems (such as Vtech) cannot be separated or switched out at the sale. Video games will be in a locked cabinet near checkout to prevent theft. How to Price: Prices can range from $.50 to $50 in this category, depending on the item. Price to sellespecially for books & DVDs as there are always lots to choose from at the sale. If you would like a high-priced item placed inthe High Value Cabinet near Checkout, please see a team member during Drop Off. How to add Consignor Tag: When tagging books, please attach your tag to the book with clear tape that can be removed without damaging the item. Tape tag to the outside cover of glossy books and to the inside cover of books that will easily tear when removing the tag. Please do not use masking or double sided tape. Hole-punch JBF tag and tie to sets. What do we accept? 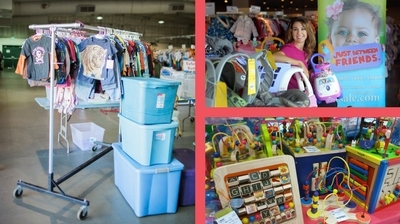 Diaper bags, infant carriers, backpacks, and purses are great consignment items. Safety is our top priority. Please inspect all carefully to make sure items have not been recalled (link), stained, damaged or are missing pieces. How to Package: Please zip-tie items to an adult-size hanger. If you would like to place high-priced items (over $20) in our High Value Cabinet near Checkout, please see a team member at Drop Off for assistance. Why Consign? What do I get? Do you have unused and outgrown infant, children's and maternity items cluttering up your house? Would you like to earn money on those items? We can help! The average consignor sells over $350 at JBF Fairfield/Trumbull! That's money you can use for the next season's clothes, kid activities or a vacation! We know you're busy, so we make it easy. Prepare the items and drop them at the sale and then WE do the rest. No haggling, no meetups... just an easy way to earn CASH on your CLUTTER. If you consign, you earn 60-75% of your sales plus highly desired presale passes to shop before the public! Do It Yourself will prep, tag and price their own items at home & drop the items off at our sale. There is an $11 consignor fee that is taken from your check. We tag, price and store items for you with our VIP option. In turn, you get 45% on your sold items. There is a $20 consignor fee to cover storage and supplies & $.10 per hanger for clothing with no hangers. Presale Day hours are 10a - 8p. Here is the presale schedule for volunteers & consignors. Go to Event Details page for the full schedule. Have questions? We're here to answer them. Just contact us! Find the upcoming sale consignor waiver, schedule, and other guides to help you consign! Want to earn more & meet cool moms?